There is an update rolling out for the official YouTube app in Play Store, but it is rolling out quietly. You may have not received the update yet, so you can download it here and install it manually. The new version of YouTube, 5.2.27, replaces old version 5.1.10. As you can see there is a change from 5.1 to 5.2 and this usually indicates that there are some big changes coming ahead of us. If you install the new update you will not be able to see any new features or UI changes. However, thanks to Android Police who did an APK Teardown of the app and looked inside its code, we now know that some exciting features are coming to us and they couldn’t be more awesome. Google will probably introduce these new features with their next official update to the YouTube app, as they are currently hidden in version 5.2.27. Probably the most exciting and most asked for feature is the Background Audio feature. What does this do? This will allow you to listen to the audio stream from the YouTube app while switching to another app or when turning the screen off. 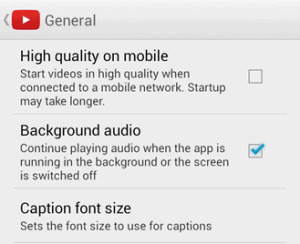 Until now if you switched apps or turned off the screen while watching a YouTube video the playback would have stopped. The other exciting change we are waiting is offline support, something Google still needs to perfect on their YouTube app. 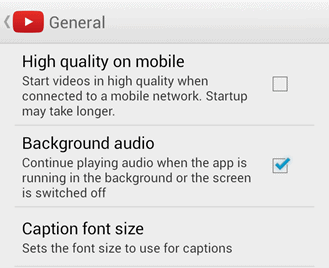 You can download YouTube 5.2.27 from the following link – Download com.google.android.youtube-5.2.27.apk.